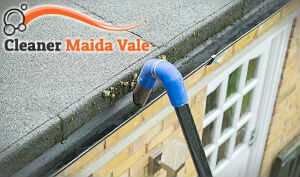 We are a long-standing company, local to Maida Vale, and specialise in providing quality gutter cleaning services to home owners and business customers, residing in and around this area. No gutter is impossible for us to get to as we have invested in the latest high-access telescopic poles and a vacuuming system, capable of blasting away all compressed debris from our customers’ gutters and downpipes. Using our services is the surest way to avoid water damages to your property and maintain your old gutters in a top-notch condition for years to come. Don’t worry about pricing – no other company can beat our sensible rates! It is a well-known fact blocked gutters can lead to a variety of damages to one’s property. These include excess damp leading to mould formation, cracked foundations, vermin infestation, damages to soffits and fascia boards… Shall we go on? We believe you get the picture. 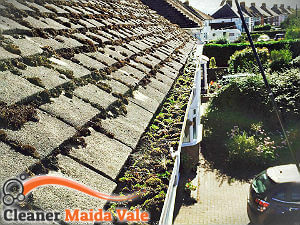 However, there is no reason to sink into despair as using our quality gutter cleaning service in Maida Vale will ensure your gutters are functioning at their best and thus, spare you the trouble of dealing with these costly damages. It matters not when you call. Our experts can visit you any day of the week for a free evaluation of your guttering system’s condition. They will report any issues and clean your gutters using high-end equipment like the aforementioned telescopic poles and a powerful wet/dry vacuuming system to blow away all leaves, moss, acorns, twigs and dirt blocking your downpipes and gutters. Many customers can’t help but wonder whether our services are effective before they book us. The truth is they are and we can prove it to you! We have a small digital camera attached to the telescopic pole, so we are able to take a picture of the results after the clean is over. This will give you a peace of mind that your gutters are serving their purpose again. If you require high-quality gutter cleaning, make sure you contact us for an appointment. We never disappoint our customers!